Dedicated to exploring "the imaginary, the nostalgic and the otherworldly," Quail Bell Magazine is both an online and print venture published and produced under the Quail Bell Press & Productions umbrella. Articles, stories, essays, poetry, illustrations and photography from a wide range of creative souls comprise the ever-growing collection as the Quail Bell community continues to grow. We had a chance to talk to Christine Stoddard (check out our feature on her career), the Co-owner and Creative Director behind it all. Thank you for taking the time to give us a behind-the-scenes look at Quail Bell Press & Productions, Christine! Tell us a bit about how Quail Bell was started. I have loved books my whole life and 'zines and blogs since middle school. Quail Bell Magazine evolved from my urge to unify my blogging and zine-ing ideas, habits, and ambitions. So I registered the domain name while a student at VCUarts, and tinkered with the website for a while, pulling in classmates and strangers from the Internet alike. In 2011, I finally got serious and wrangled a real team, including Julie DiNisio and, a little later, Jade Miller, plus several others. Soon we had submissions coming in from all over the world. Unfortunately, despite speedy progress that summer and early fall, Quail Bell's managing editor, Josephine Stone, was hit and killed by a valet driver right after we released our first print issue in October 2011. It took a while to recover from that shock, but I was lucky enough to meet Kristen Rebelo in May 2012. By fall 2012, it was really just Kristen and me running Quail Bell, since our friends Jade and Julie had decided to pursue careers in teaching. Kristen and I shut down the website and gave it what it really needed: a professional design overhaul. 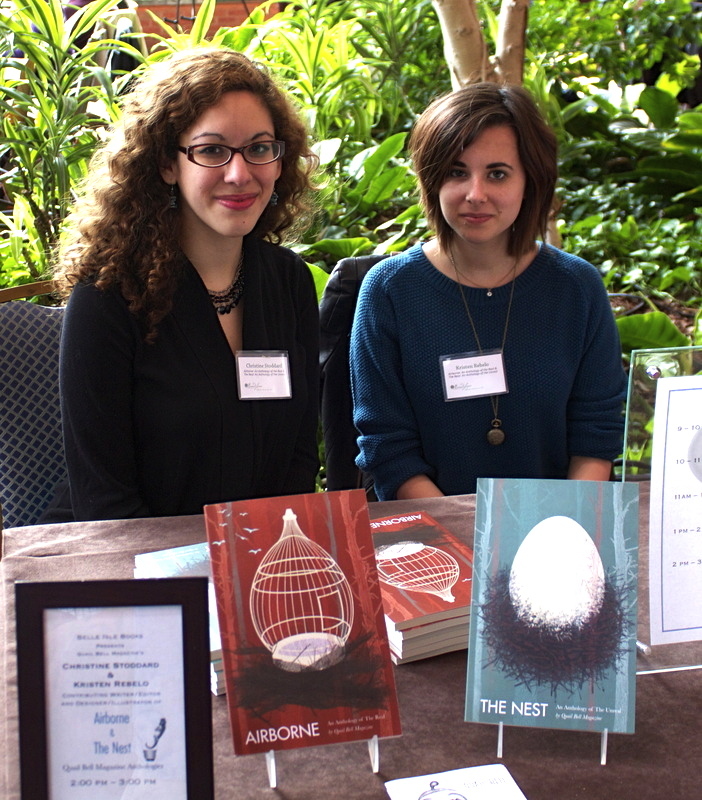 In June 2013, I made Kristen my business partner as co-owner of Quail Bell Press & Productions. Now we update QuailBellMagazine.com everyday, while also working on other original Quail Bell projects. We do art, media, and communications work for clients, too. Pictured: Christine Stoddard & Kristen Rebelo. It sounds like there are several components of Quail Bell— please elaborate a bit on each project for us! There’s no mistaking a quail—not with its distinctive topknot and rhythmic bob. Likewise, there’s no mistaking Quail Bell. Co-owned by Kristen Rebelo and me, Quail Bell Press & Productions is the umbrella company to various and memorable creative projects and endeavors. These efforts have inspired not only thought but conversation and action. Quail Bell Magazine first received a nod from Richmond, Virginia's creative scene in October 2011 when Style Weekly recognized me as one of the city’s “Top 40 Under 40.” Only two weeks prior to bagging that accolade, The Quail Bell Crew released its first print ‘zine—a stapled, black and white rag with color covers—at the Richmond ‘Zine Festival. Fast forward to Issue 5—full-color, perfect-bound, and printed by Richmond’s own Carter Printing Company, to be unveiled at the Brooklyn ‘Zine Festival, this April. That same fateful month, October 2011, marked Quail Bell’s first fashion show, “Once Upon a Dream,” sponsored by the VCU Barnes & Noble. Last year, the magazine’s third annual fashion show, “Timeless Zeitgeist,” took place at the sleek Selba Lounge. What had otherwise been a month marked by happiness and accomplishments, October 2011 also brought the untimely death of Quail Bell Magazine’s managing editor, Josephine Stone. But The Quail Bell Crew has emerged from that much publicized tragedy with renewed passion and vigor for its mission. I earned a national emerging artist grant from The Puffin Foundation to conceive Mixteco/RVA shortly before graduating from VCUarts, where I studied under novelist Susann Cokal, playwright Laura Browder, and filmmaker Mary Beth Reed. Just as I was preparing for the VCUarts Cinema Summer Intensive, I met Kristen Rebelo, then only a sophomore in the Communication Arts program. Impressed by her talent and drive, my then-associate editors, Jade Miller and Julie DiNisio, and I made Kristen Quail Bell Magazine’s art director. Once Jade and Julie began their careers as school teachers, Kristen and I decided to lead Quail Bell Press & Productions on our own. So we commenced work on Quail Bell Magazine and other projects. One such project was the aforementioned Mixteco/RVA, a photo and essay book art project on linguistic injustice in Virginia. Another was The Persistence of Poe, a 24-minute documentary film about Edgar Allan Poe’s life in Richmond and his influence upon the city’s creative community today. Most recently, Quail Bell Magazine has had two books published by Belle Isle Books, an imprint of Brandylane Publishers. These books are The Nest: An Anthology of The Unreal and Airborne: An Anthology of The Real, and both are available on BarnesAndNoble.com, Amazon.com, and in brick and mortar retailers. A few of Quail Bell’s current clients include Z Idea Factory in Arlington, Virginia, environmental activist Brock Evans in Washington, D.C., and Foxhall Design Company in Port Republic, Maryland. Quail Bell Magazine also boasts several partners, such as Luna Luna Magazine, Beltway Poetry Quarterly, and VIDA, a national organization for women in the literary arts. The Quail Bell story continues everyday on QuailBellMagazine.com and QuailBell.com. What are some of the logistics involved in running Quail Bell Press & Productions? Quail Bell Press & Productions is now my full-time gig. It has not always been, however. Since graduating, I have juggled Quail Bell with full-time jobs as an associate producer at a major television station and, more recently, as an assistant editor at a respected regional magazine. In between working at the TV station and the regional magazine, I worked on Quail Bell full-time, but I found that I was still lacking in some key skills—skills the regional magazine especially helped me develop. These jobs mainly helped me build up my business know-how and become more detail-oriented (in regards to marketing and data management in particular), which I needed to better attract Quail Bell clients and manage dealings with them. As my partner Kristen is just graduating from college this May, we have discussed how important it is for her to have a full-time job for at least a year or two, as well. So she will be juggling her job and Quail Bell for some time, too. Quail Bell does not have a brick and mortar presence. Kristen and I operate out of our home offices and usually meet clients at coffee shops or their own offices. Of course, much of our business can be conduced online and over the phone. That being said, we do host or participate in regular events to promote Quail Bell's original products, such as the magazine and the anthologies. In March, for instance, we tabled at the Virginia Festival of the Book and the Virginia Production Alliance State of the Industry Expo. This month, I screened a Quail Bell original film, A Train Runs Through It, at the New York Transit Museum. (You can now find our anthologies in their gift shop.) At the end of the month, we're tabling at the Brooklyn 'Zine Festival. We enjoy introducing our work to new audiences in person. We manage each Quail Bell project differently, meaning there's a unique process and budget. A project may be backed by Kickstarter, IndieGoGo, a grant, and/or a percentage of funds we set aside after completing a client project. Kristen and I entered a cooperative publishing agreement with Brandylane Publishing for our anthologies, for instance. Meanwhile, we sell advertising on QuailBellMagazine.com for individual artists, small businesses, non-profits, etc. The magazine website also has a shop. Then, of course, there are client projects, which vary according to what the client wants, their timeline, their budget, etc. In a typical day, I might update QuailBellMagazine.com, answer client emails, write and send press releases, plan a Quail Bell event, work on a client project, and work on an original Quail Bell project. Quail Bell Magazine, Issue 5. What does the future look like for Quail Bell? Bright! Over the next month or so, we will be promoting our latest print 'zine, Quail Bell: Issue 5, getting our anthologies into more bookstores, securing more advertisers for the magazine, prepping for the New York Poetry Festival, and wrapping up our documentary, Richmond's Dead and Buried. That is all I will reveal for more, but there is certainly a lot in the works now and in the near future. If someone wanted to be published on the website or in the magazine, what should they do? Kristen and I review submissions for QuailBellMagazine.com everyday and review submissions for the print 'zine on a quarterly basis. A piece must first be accepted to the website to be considered for the print 'zine. Please check out our submission guidelines here. To order Quail Bell Magazine, art prints and apparel, visit the Quail Bell shop. Posted on April 15, 2014 by Alyssa W. Christensen and filed under Articles, Featured Articles.